Venezuelan opposition leader Juan Guaidó declared himself the country’s interim president amid nationwide protests Wednesday, in a bid to seize power from sitting leader Nicolás Maduro. 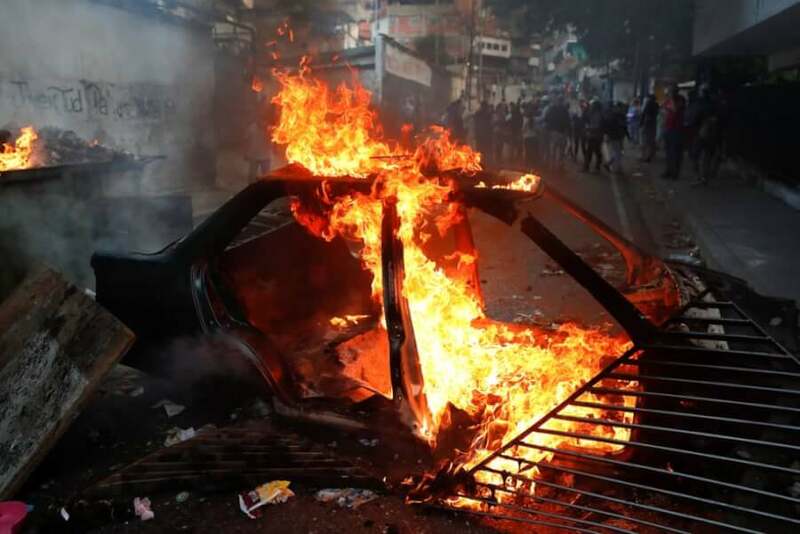 So, more than dozens of people are killed and the protests continue. Twenty-six people have been killed since the latest wave of protests against Venezuela’s President Nicolas Maduro broke out four days ago, the Caracas-based Observatory of Social Conflict said on Thursday. 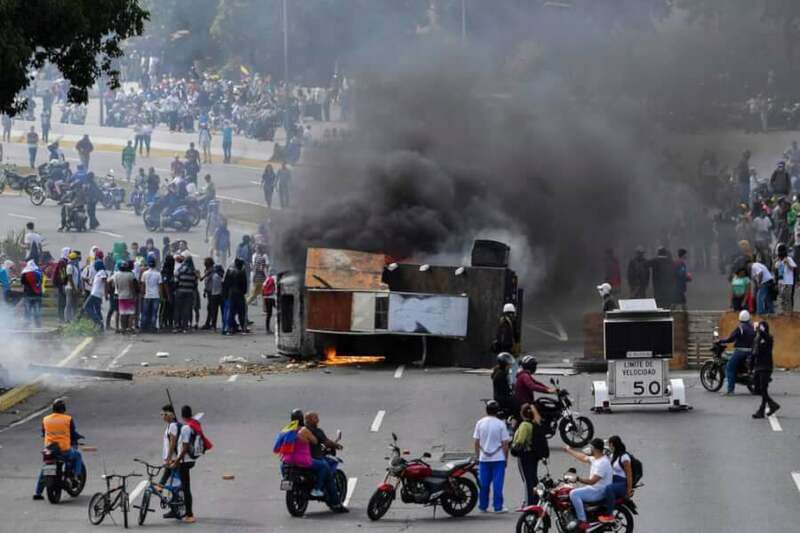 The previous toll from the protests – which began when a group of soldiers took over a command post in the north of the capital in defiance of the socialist regime – had stood at 16. 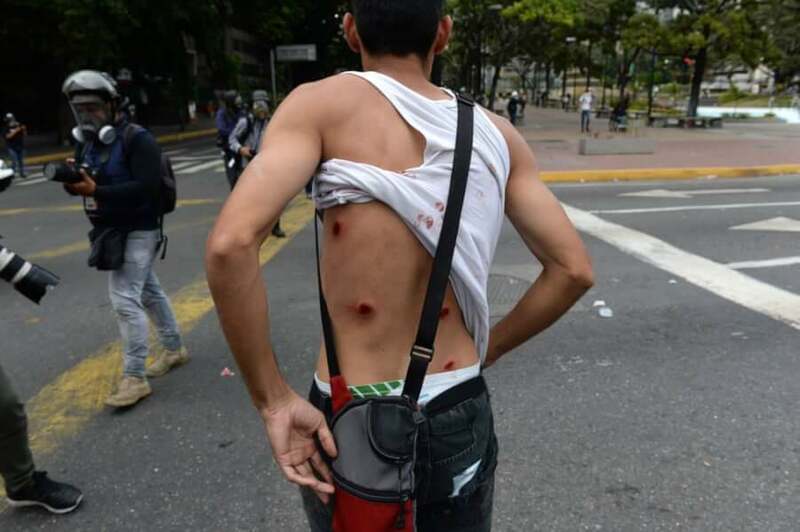 In some places, armed forces have fired tear gas and rubber bullets to subdue protesters, some of whom threw stones. 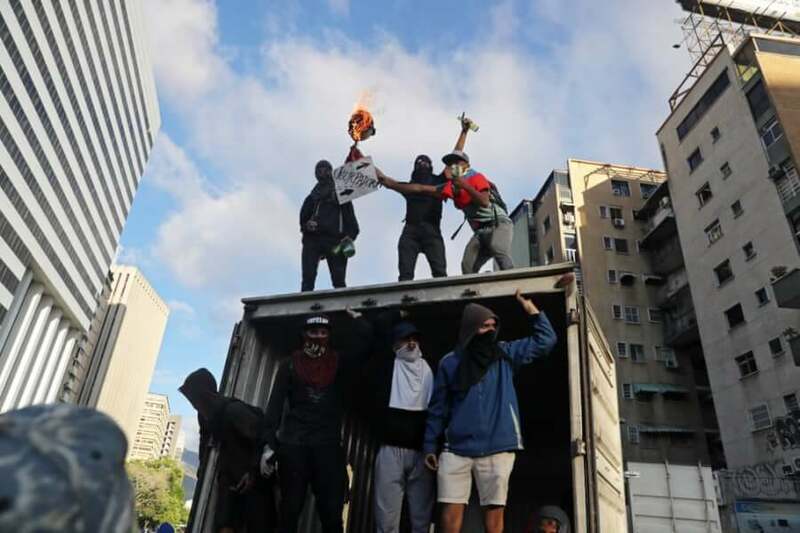 For a third consecutive night, there were reports of looting in poor neighborhoods in the capital of Caracas and clashes between protesters and state security forces. 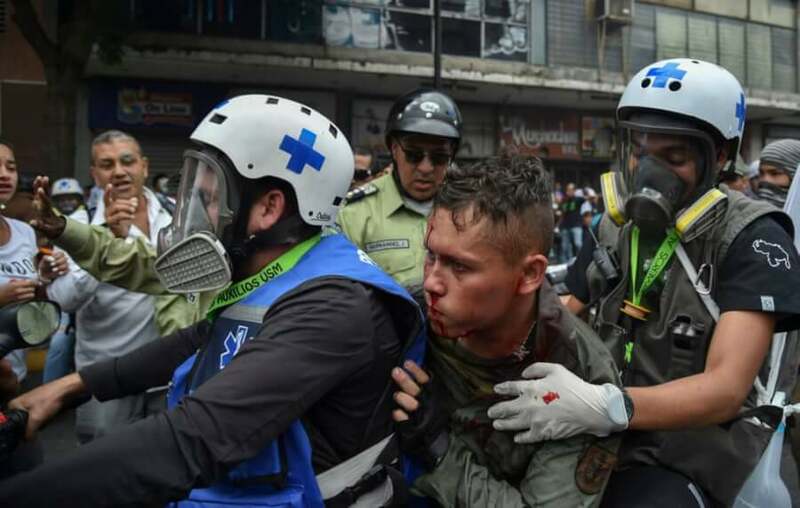 Amnesty International is calling on Maduro to uphold demonstrators’ rights and immediately remove any military or law enforcement efforts involved in repression. Meanwhile, military commanders across the troubled South American nation took to the airwaves to vow loyalty to hard-leftist Maduro. Tens of thousands are gathering across Venezuela to march in protest against President Nicolás Maduro. National Assembly president Juan Guaidó, who organised the opposition march, is urging the army to disobey the government. On Wednesday he took an oath where he declared himself as “acting president” of the country. Before the protests, the US government signaled its support for Mr Guaidó and called for President Maduro to go. Early images from Wednesday’s protests show some demonstrators facing off against National Guard security forces in the capital Caracas, and tear gas being fired. Four people are said to have died in clashes before the protests, as riot police mobilise to guard demonstrators. 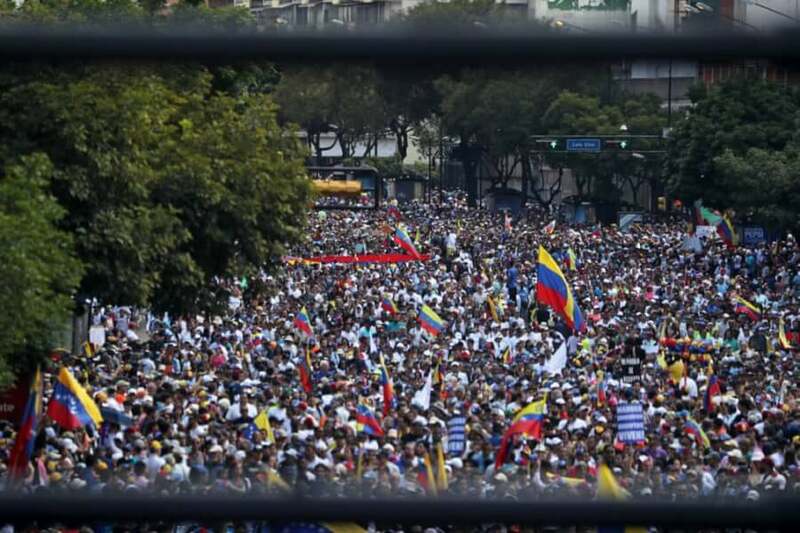 Anti-government protestors have turned up in “many cities” across the country, newspaper Tal Cual reported Wednesday. Other demonstrations are being held in support of Mr Maduro. Venezuela has been in economic freefall for a number of years under the president’s leadership. Hyperinflation and key shortages, including of food, has forced millions out of the country. Since taking office in 2013, Mr Maduro has been condemned at home and abroad for alleged human rights abuses and for his handling of the economy. Wednesday’s protests were called by Mr Guaidó, who heads the opposition-run Congress, after the president was sworn into office for another six years earlier this month. What counties recognize Juan Guaidó as president? 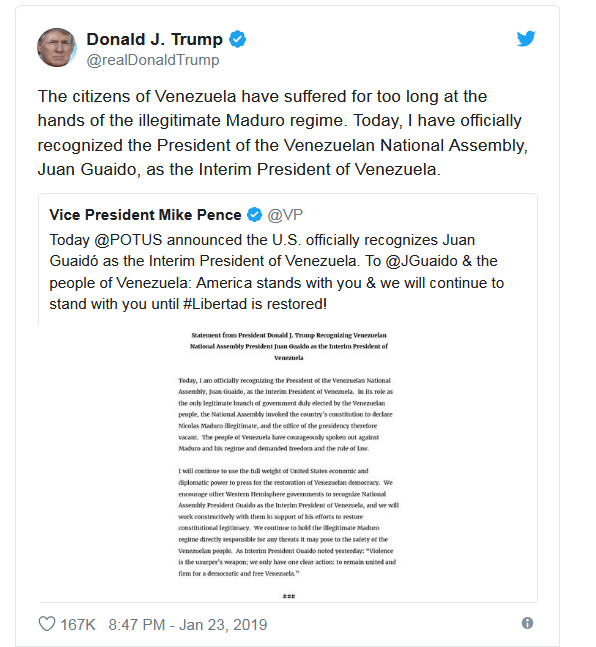 In a statement U.S. President Donald Trump recognized Guaido as Venezuela’s legitimate interim president. Chilean President Sebastian Pinera, Colombian President Ivan Duque, Brazilian President Jair Bolsonaro, Peruvian Vice President Mercedes Araoz and Canadian Foreign Minister Chrystia Freeland each said Wednesday that their respective countries recognize opposition leader Juan Guaido as the legitimate interim president of the country. Venezuela Elections 2018: President Maduro Wins Second Term but US Called it ‘Sham’ – New Sanctions to Expect?